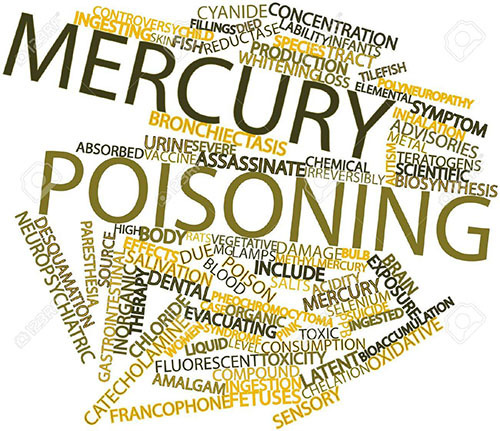 Mercury poisoning is the ill effects on human's nervous system and other bodily systems due to the overexposure of mercury. Mercury is a neurotoxin, meaning it affects the nervous system. People who suffer from mercury poisoning can cause personality changes, nervousness, trembling, and even dementia. Today, people are more aware of the dangers of mercury and many of its uses have been discontinued. However, mercury exposure is still dangerous for people in many industries, and mercury is present in the environment around us. There is also the risk of exposure due to a thermometer breaking or mercury leaking out of a thermostat or any number of mercury-containing devices. If mercury vapor is inhaled, as much as 80 percent may enter the bloodstream. Children (and unborn fetuses) are the most vulnerable from the effects of mercury poisoning, and mercury-contaminated fish are the most likely source of it. Mercury poisoning is nothing new. In 1953, Mercury poisoning from a small fishing port of Kyushu island in Japan became a global news story. One of the worst industrial disasters in history was caused by dumping mercury compounds into Minamata Bay, Japan. The Chisso Corporation, a fertilizer and later petrochemical company, was found responsible for polluting the bay from 1932-1968. It is estimated that over 3,000 people suffered various deformities, severe mercury poisoning symptoms or death from what became known as Minamata disease. Why am I trying to bring this mercury poisoning out to you again? It's because something is happening with today's children especially with their behaviors. Many children today seem to be different from children long ago. I wrote this especially for young couples who want to bear healthy babies and for their children to grow up healthy. I tried to gather data of children who were affected by mercury poisoning from my researcher friends in Japan and USA. I found that these children have all similar behaviors such as slow reflexes, poor vision, headache, and inability to think. 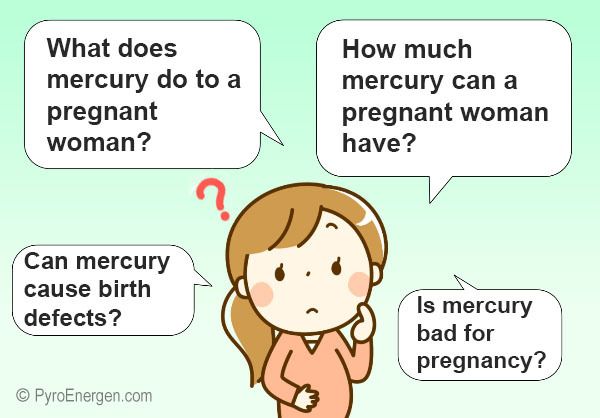 Did you know that mercury has been used in treating illnesses for centuries, such as typhoid fever, syphilis, and parasites? But today, mercuric medicines and devices are generally considered dangerous, which is why there's a controversy whether mercury should be used in dentistry as it's the main ingredient in dental amalgams. Today, the use of thermometers and sphygmomanometers containing mercury is declining and has been banned in some countries, states and medical institutions, being replaced by electronic thermometers. Most thermometers now use pigmented alcohol instead of mercury. 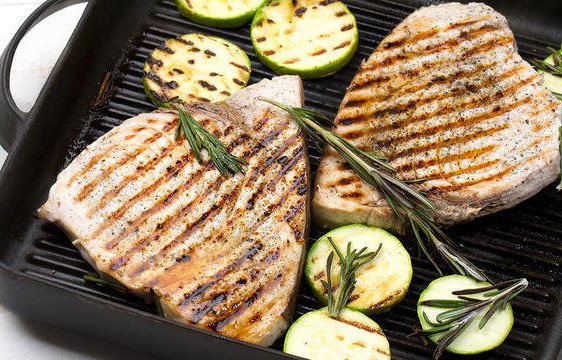 Swordfish and shark tastes great, especially when they’re grilled or broiled. But reports that these and some other large predatory fishes may contain methyl mercury levels of 1 part per million (ppm) limit has dampened some fish lover’s appetite. Scientists responsible for seafood safety are also concerned about eating these types of fish. They agree that the fish are safe, provided they are eaten occasionally and not more than once a week as part of a balanced diet. Fish absorb methyl mercury from water as it passes over their gills and as they feed on aquatic organisms. Larger predator fish are exposed to higher levels of methyl mercury from their prey. Methyl mercury binds tightly to the proteins in fish tissue, including muscle. Cooking does not reduce the methyl mercury content of the fish. In general, methyl mercury levels for most fish range from less than 0.01 ppm to 0.5 ppm. Certain species of very large tuna, typically sold as fresh steaks or sushi, can have levels over 1 ppm. (Canned tuna, composed of smaller species of tuna such as skipjack and albacore, has much lower levels of methyl mercury, averaging only about 0.17 ppm.) The average concentration of methyl mercury for commercially important species (mostly marine in origin) is less than 0.3 ppm. The first recorded mercury poisoning, which occurred in Minamata, Japan, resulted to a death toll of more than 120 people. Some of them became very ill including their pets, mostly due to nervous system damage from eating fish (often daily over extended periods). These fishes came from waters that were severely polluted with mercury from local industrial discharge. The average mercury content of fish samples from this area ranged from 9 to 24 ppm, though, some fish were found to have levels as high as 40 ppm. Fish is an important source of high-quality protein, vitamins and minerals. However, normal pattern of consumption does not put anyone in danger of mercury poisoning. It is when people eat fad diets--frequently eating only one type of food or a particular species of fish. Since a fetus may be more susceptible than the mother to the adverse effects of methyl mercury, pregnant women and women of childbearing age, who may become pregnant, are advised to limit their consumption of shark and swordfish to no more than once a month. These fishes have much higher levels of methyl mercury than other commonly consumed fish. Advise for persons other than pregnant women and women of childbearing age who may become pregnant—regular consumption of fish species with methyl mercury levels around 1 part per million (ppm), such as shark and swordfish, should be limited to about 7 ounces per week (about one serving) to stay below the acceptable daily intake for methyl mercury. For fish with levels averaging 0.5 ppm, regular consumption should be limited to about 14 ounces per week. Current evidence shows that nursing women who follow this advice do not increase the risk of exposing their infants to methyl mercury. Consumption advice is unnecessary for the top 10 seafood species, making up about 80 percent of the seafood market--canned tuna, shrimp, pollack, salmon, cod, catfish, clams, flatfish, crabs, and scallops. This is because the methyl mercury levels in these species are all less than 0.2 ppm and few people eat more than the suggested weekly limit of fish (2.2 pounds) for this level of methyl mercury contamination. Today, toxicologists are developing a more complete database for addressing low-level methyl mercury exposures from fish; however, they consider the 1 ppm limit to provide an enough margin of safety. This doesn't mean that it is safe to regularly and frequently eat fish that contain 1 ppm methyl mercury. The limit was established considering the types of fish people eat, the levels of methyl mercury present in each species, and the amounts of fish that are normally consumed. Results of surveillance samplings by toxicologists for methyl mercury in fish are shown below. The limit of quantifiable detection is 0.10 part per million (ppm); therefore, any values less than 0.10 ppm are shown as ND (not detected). The action level is 1 ppm. From the above data, you can find fishes that have less mercury contents.